The mission of the St. Paul’s Catholic School community is to provide an environment where the Gospel message and teachings of the Catholic Church are woven throughout quality education. each child should be recognized as an individual and is capable of learning. children should be instilled with a strong sense of responsibility for their learning. teachers should provide a variety of technological and educational approaches to prepare each child for an ever-changing world. teachers should promote personal best effort to achieve academic excellence. open communication and mutual respect prepares the heart, mind and soul to meet life’s many and varied challenges. service to school, parish, community, country and the world is essential. St. Paul’s is a place where faith andknowledge intertwine. St. Paul’s Catholic School’s history spans the years of 1949 to the present day. The school boasts long-standing traditions, a rich past, and remembers the focal memory of our existence - the life, death, and resurrection of Jesus Christ. In 1948, the Sisters of St. Benedict came to teach religion at St. Paul’s on Saturday mornings. Their influence prompted St. Paul’s Church to break ground for St. Paul’s Catholic School in 1949. It was to be one of the most modern parochial schools for this era. In January of 1950, the school opened for grades 1-4. 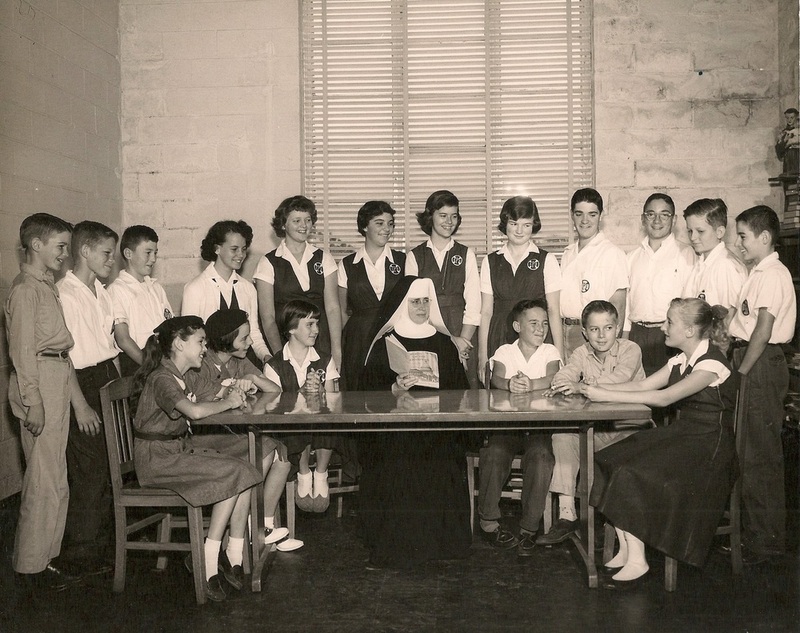 Grades 5-8 were added in fall of 1950 under the leadership of Sister Annunciation, O.S.B. Ninety students were enrolled at this time and Srs. Irma, Cecilia, Thecla, and Beatrice were in their element. Fr. Murphy was transferred to Bradenton and Fr. James F. Nelan became pastor of St. Paul’s in November of 1951. The first P.T.A. was organized the following year. The community joined together to raise funds to promote the success of St. Paul’s Catholic School. In 1977, St. Paul’s was a school of 270 students consisting of one classroom each from Kindergarten to eighth grade. In 1986, our much needed parish center and gym opened. Due to the growth in the beaches area, Mrs. Rosemary Spraggins, principal, encouraged Father William Kelly to make plans to enlarge the school to two classrooms at each grade level with the ability to serve 540 students. In May of 1995 (after years of planning, dreaming and building); we moved into our beautiful middle school, library and kindergarten classrooms. That summer the “old” school was renovated and central air conditioning was installed. Since this time, St. Paul’s has built a new Family Life Center that serves the families of our school and parish community. In 2004, St. Paul’s opened a PreKindergarten-4 Program and currently accepts state funding for Voluntary PreKindergarten-4 students. In 2015 we added a Kindergarten Prep class. Our K-Prep class is a bridge betweem PreK-4 (VPK) and Kindergarten. It gives our young five year old children an opportunity to learn in a hands-on environment that supports their development. St. Paul’s School has an excellent, highly qualified faculty and staff who work tirelessly to ensure the best Catholic education for our students. We have come a long way from the four r‟s: “reading, riting, rithmetic and religion.” Today, St. Paul’s is accredited by the Florida Catholic Conference and offers a complete academic program enhanced by faith formation, the arts, athletics and technology. St. Paul’s is proud to take its place as part of the largest confederation of schools in the United States.